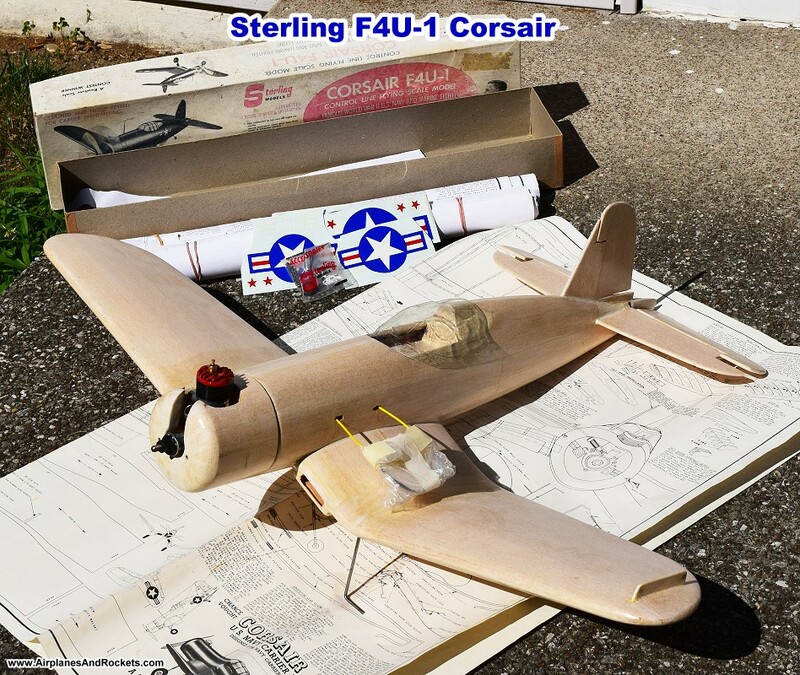 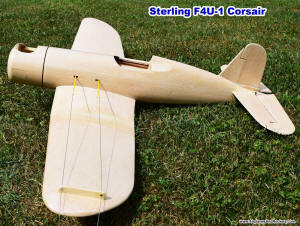 A 1960s vintage F4U-1 Corsair control line kit from Sterling showed up on eBay, so I bid on and won it! 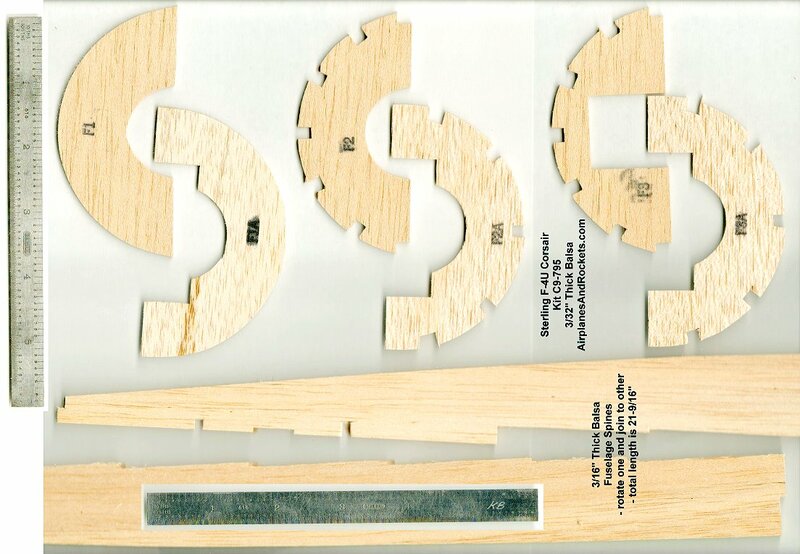 The box was faded, but the parts were all there. 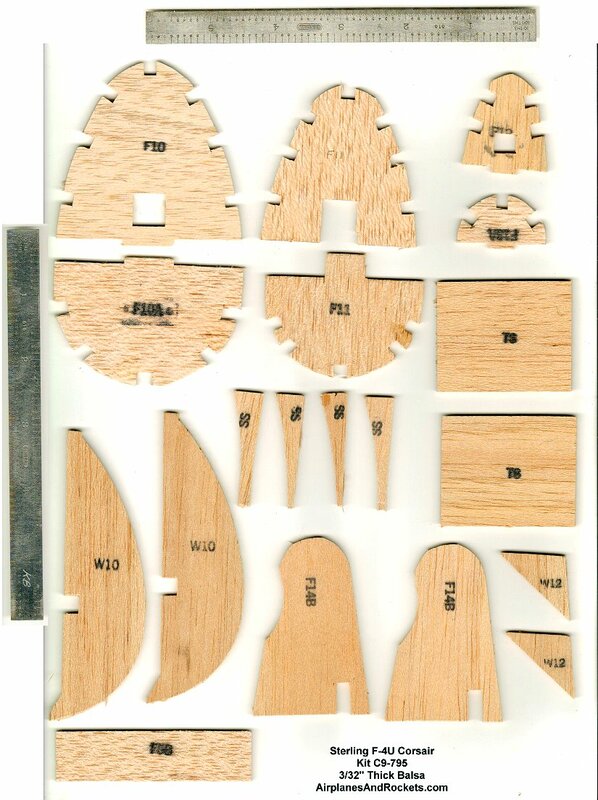 Die cutting quality was what could be expected from the era, although having bought a lot of similar kits back in the day, I can say from experience that the die cutting was pretty good. 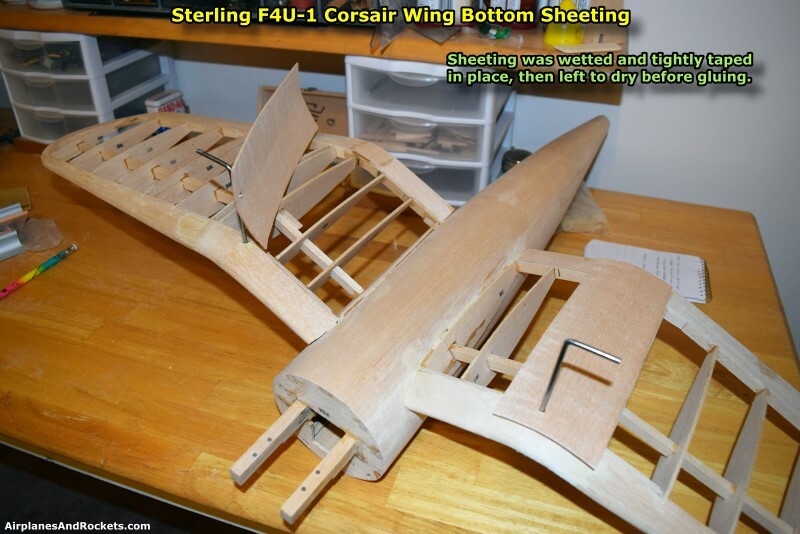 Even the plywood parts came out of the sheets fairly easily. 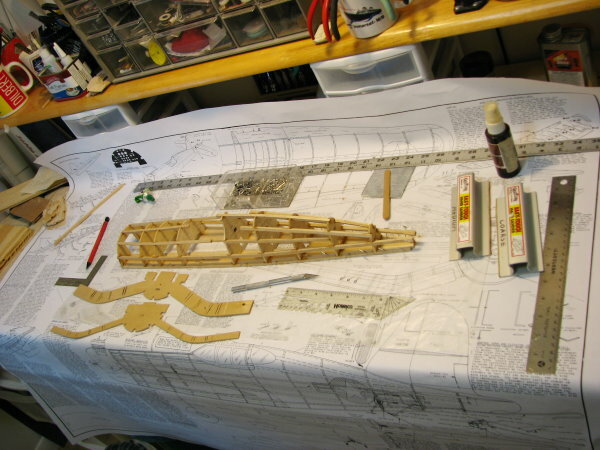 The photo below shows all the parts removed from their die-cut sheets, along with all the other parts, laid on top of the plans. 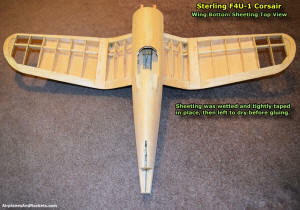 The wingspan is 36", engine size .19 to .35. 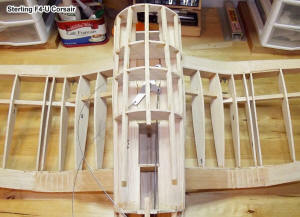 Silkspan and a couple coats of clear dope have been applied now, with light sanding between coats. 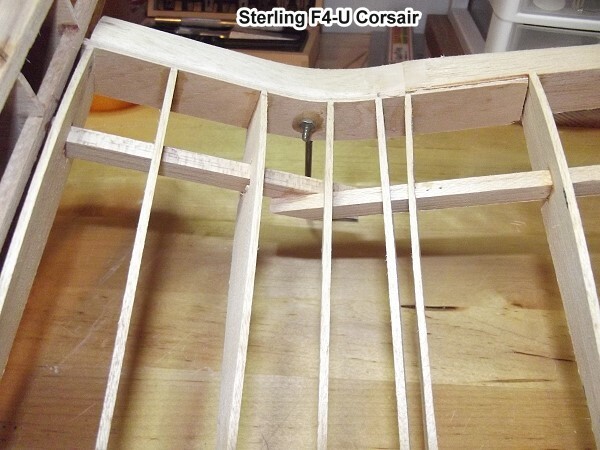 I have not yet attempted to level the surface to get a metal-like smoothness. Progress is slow due to other obligations. 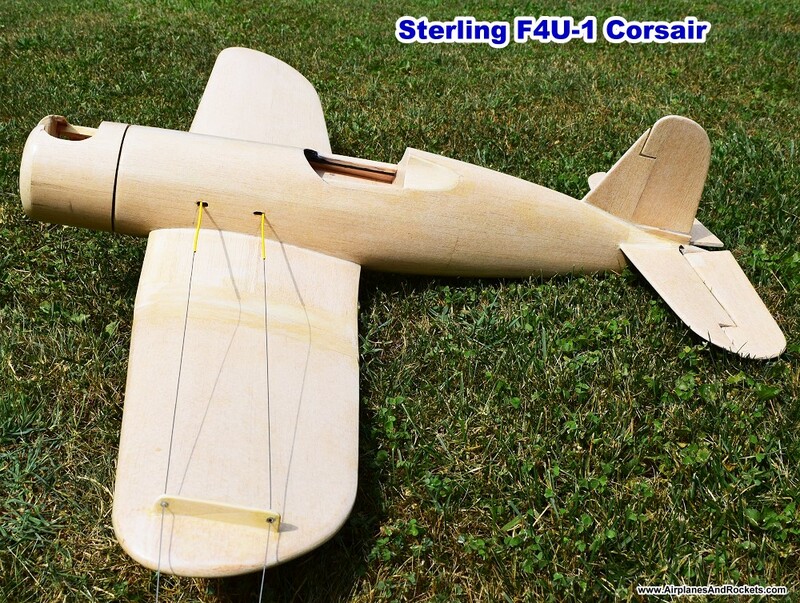 Weight without the engine is 21.4 ounces. 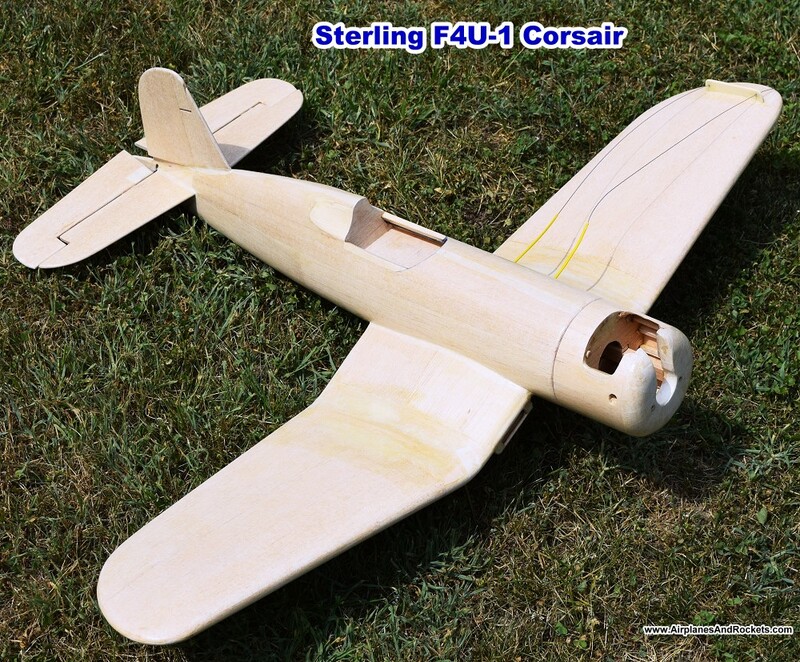 My Corsair build is complete. 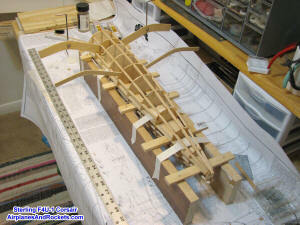 The next step is to apply the Silkspan and dope. 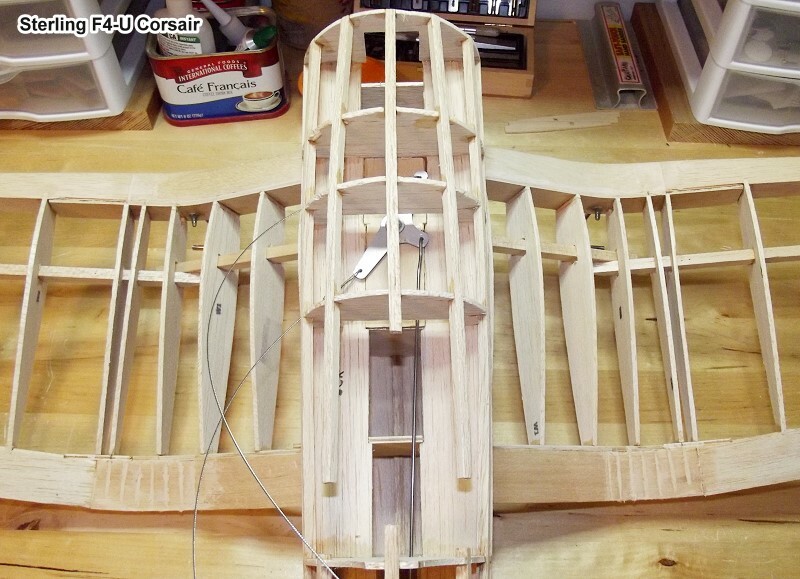 Top view of bottom wing sheeting (March 2015). Wing sheeting was fit, wetted, and taped to the frame to pre-form before gluing in place. I took the plans to Staples to have a 1:1 copy made to build on so that the originals would not be compromised. 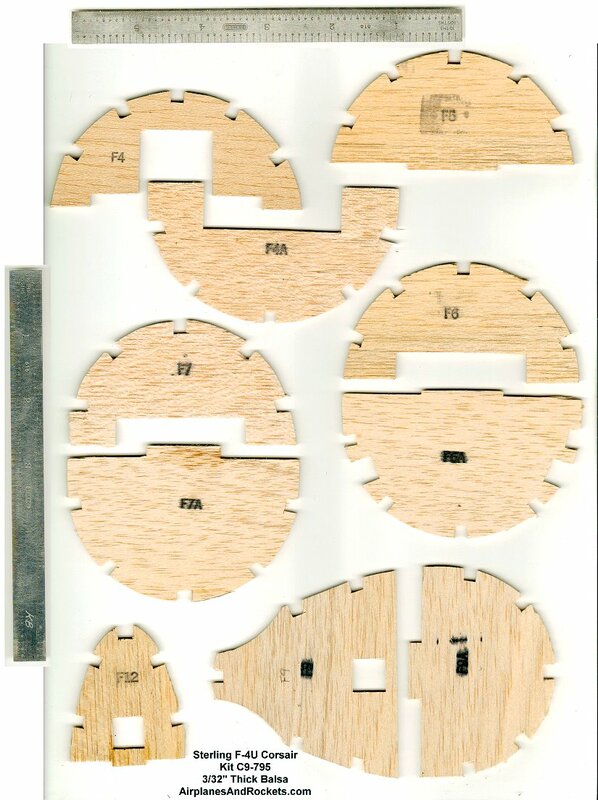 I also scanned the die-cut parts to have a record of the outlines, since the plan do not include that (see images below). 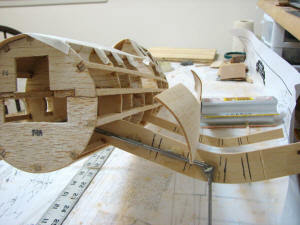 My intention is to use electric power since it is nice and clean. 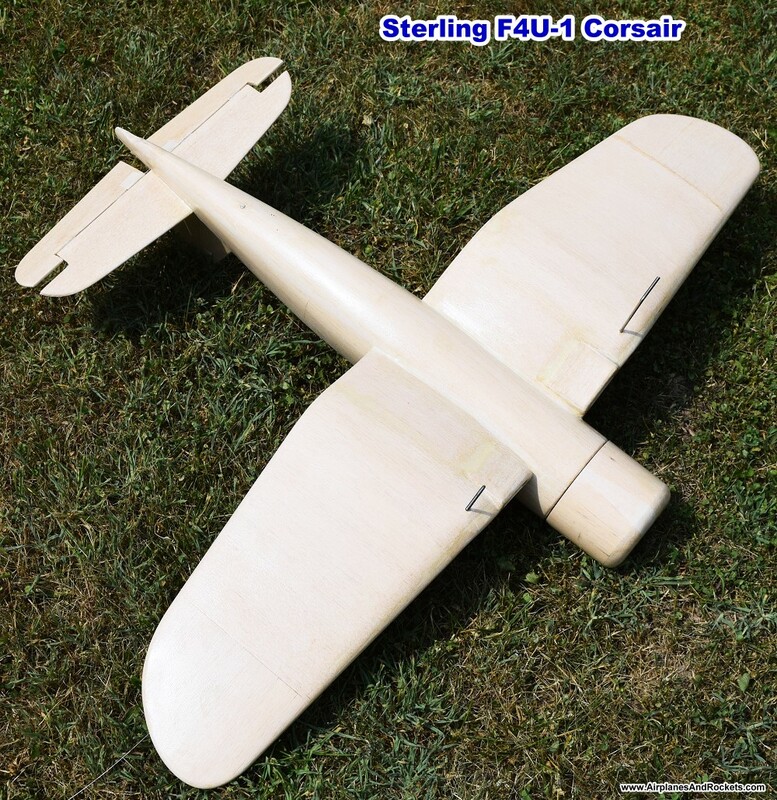 Admittedly, it will seem a bit weenie to not have a screaming internal combustion engine hauling this manly WWII fighter around the circle, but it's a compromise I'm willing to live with for the sake of no oily mess and works-every-time motor runs. 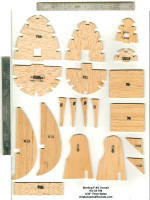 The inexpensive, programmable motor sequence timers makes operation a breeze. 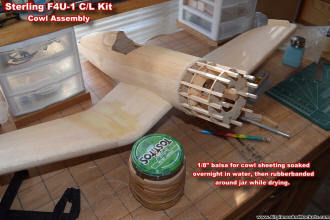 October, 2012: I have finally gotten around to resuming work on the Corsair. 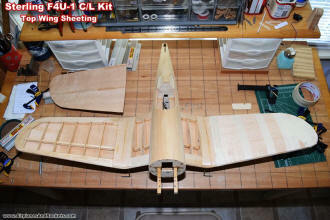 The outer wing panels were attached to the inverted gull sections. 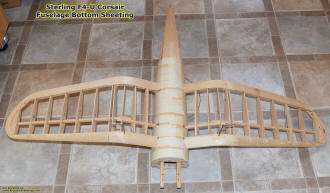 It was necessary to build an alignment jig for that process in order to assure that both wings have the same dihedral and are aligned properly in the fore-aft direction. 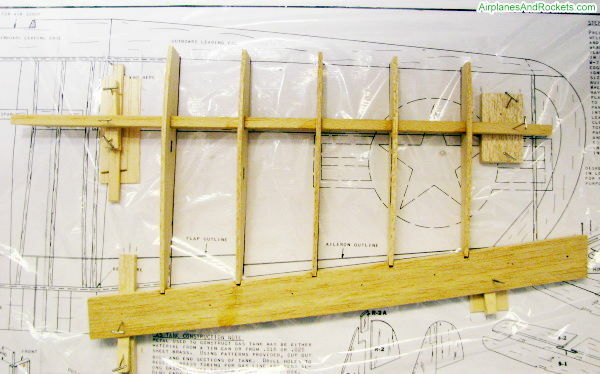 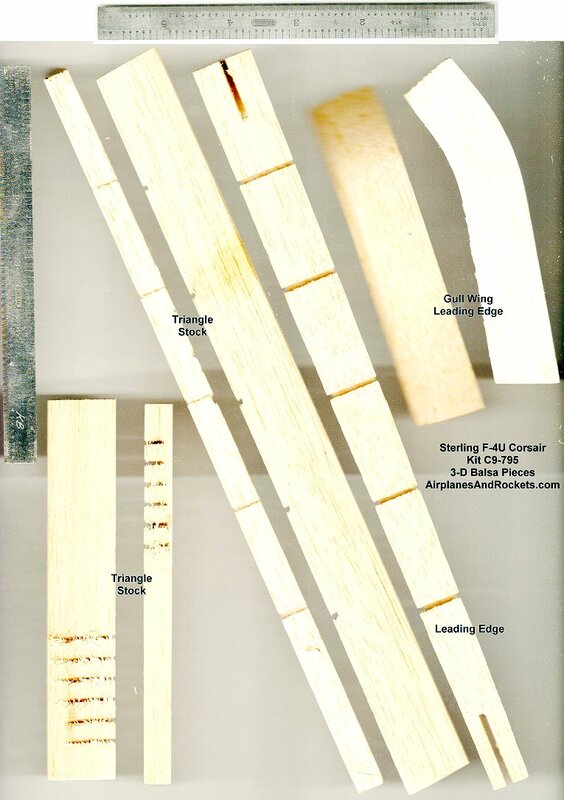 The plywood fore and aft spars that are an integral part of the fuselage formers were supplied with a crease in them to allow bending where the outer wing panels join. 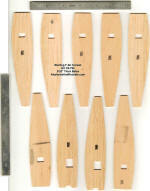 Rather than do that, I cut them back about 1/2" before the joint and glued in a solid piece of plywood across the joints. 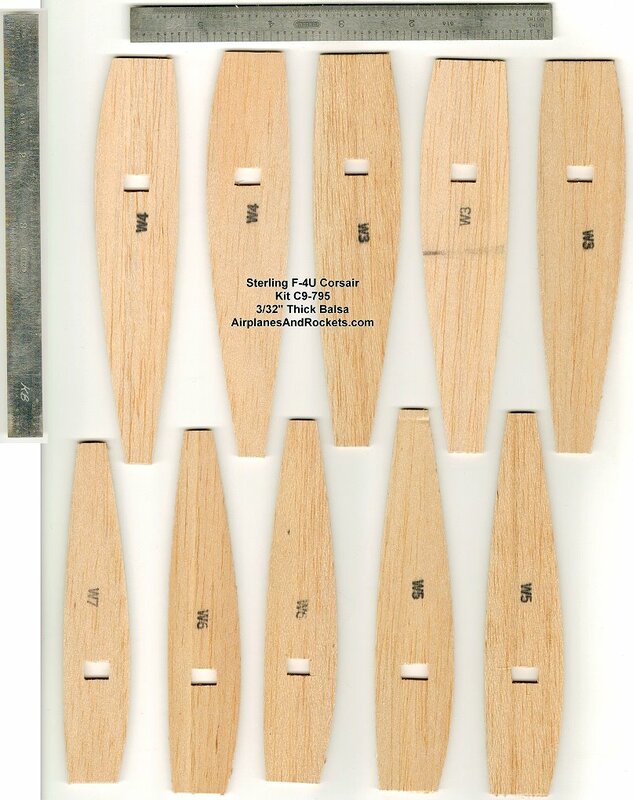 To avoid having to bend them to accommodate the change in leading and trailing edge angles, I instead sanded into the leading and trailing edges to allow the straight joiners. This should make for a much stronger joint. 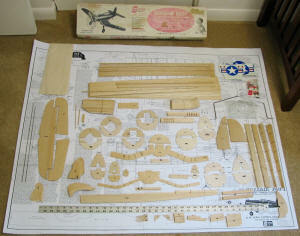 November 2010: Here is the beginning of the actual construction, after cutting out all the parts. Instructions on the plans do not indicate that the top half of the fuselage should be built first while pinned to the board. Doing so, however, will assure a straight assembly on which to attach the lower half of the formers. 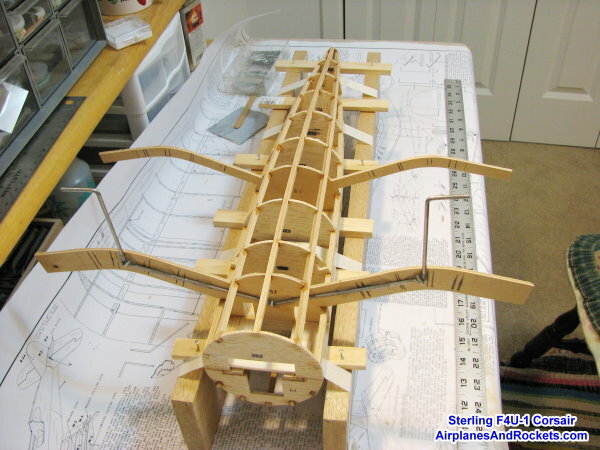 Doing it the way the plans indicates would make achieving a straight fuselage without conjuring up some sort of 3-D jig. I will probably use some sort of jig anyway when assembling the lower former halves, but this way the fuselage will be a good solid reference to begin with. 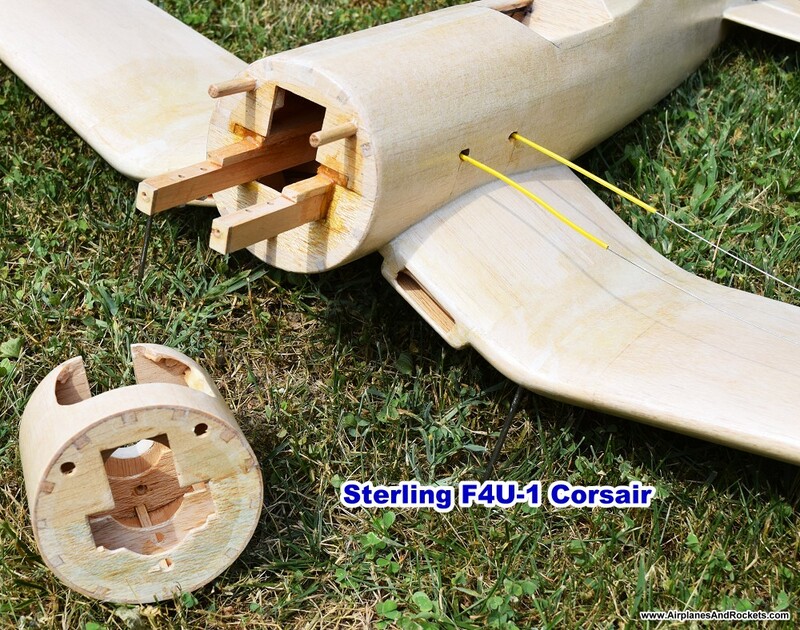 Here is the Sterling F4U-1 Corsair fuselage bottom assembly on an alignment jig that I made from two equal dimensioned pieces of wood, with thin slats run through the fuselage. 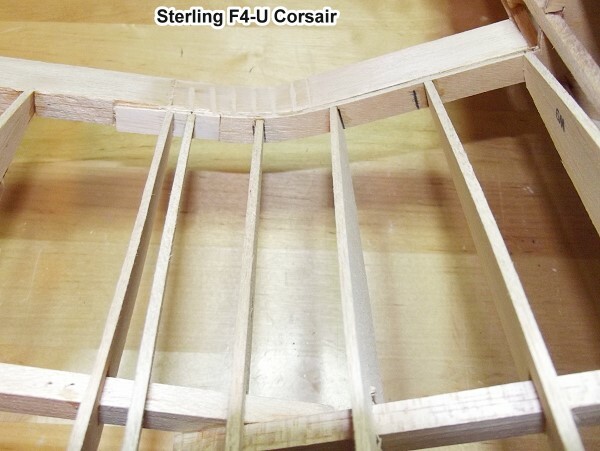 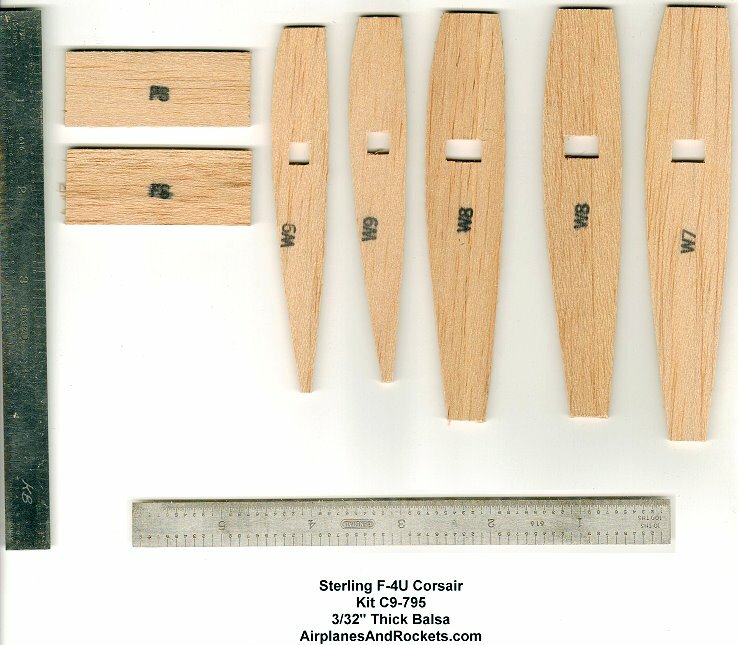 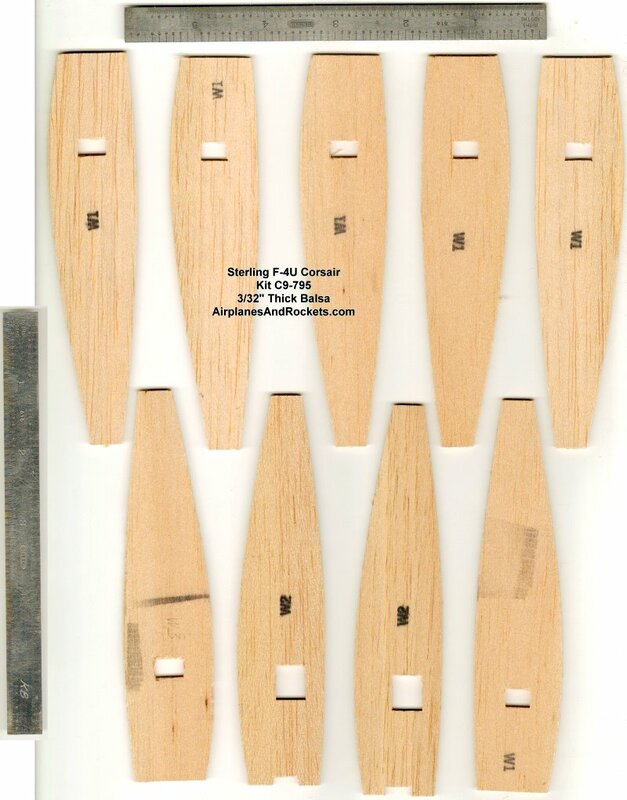 It was necessary to tape the main balsa longerons down to counter the bending force of the top stringers before the bottom stringers were added. 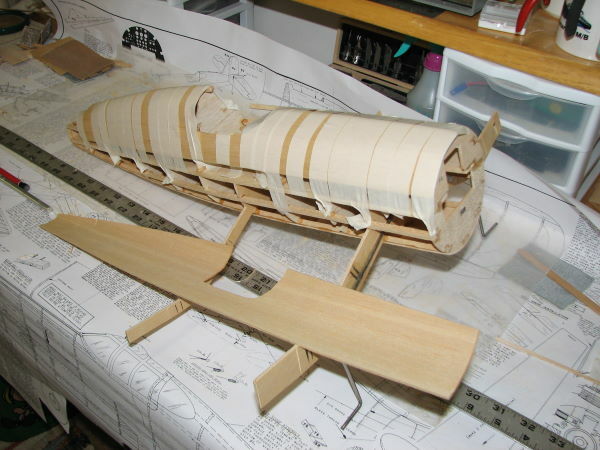 This shot also shows the landing gear attachment to the plywood former using J bolts (with a few dabs of epoxy to stabilize it on the former). 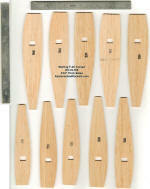 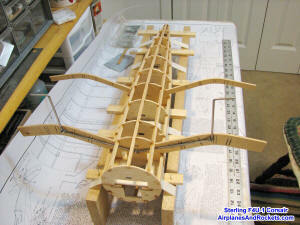 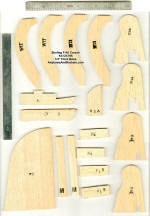 At least part of the bottom balsa sheeting will be installed prior to removing the fuselage from the jig. It should be a very strong and rigid structure once completed - which was necessary with the often rough-running engines of the day. The brushless motor that I am using will not require nearly as much beef, so I'll probably do a bit of selective lightening throughout the structure as it progresses. 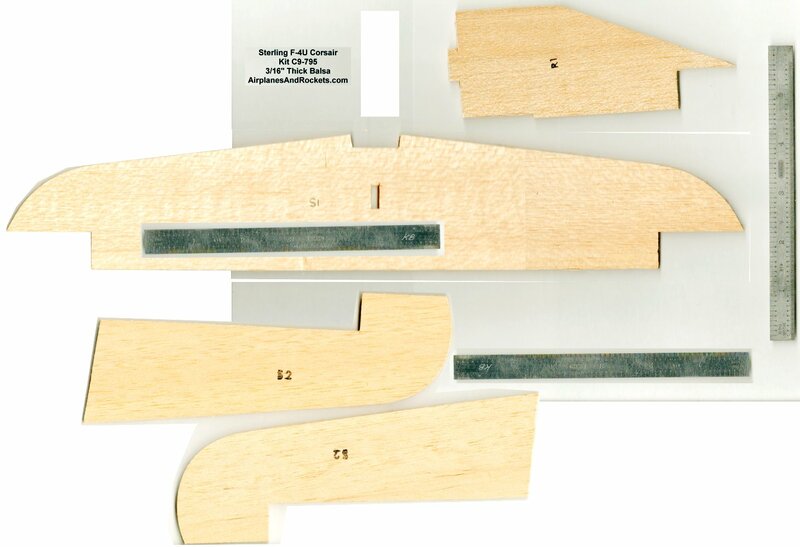 This appears to be a very well-engineered model. 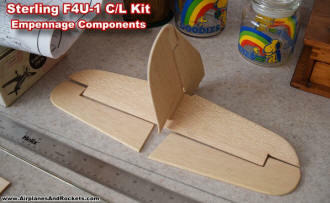 It is too bad that these kinds of kits are no longer available. The good news is that some of the folks who sell laser-cut short kits are beginning to make some nice scale control line models available. 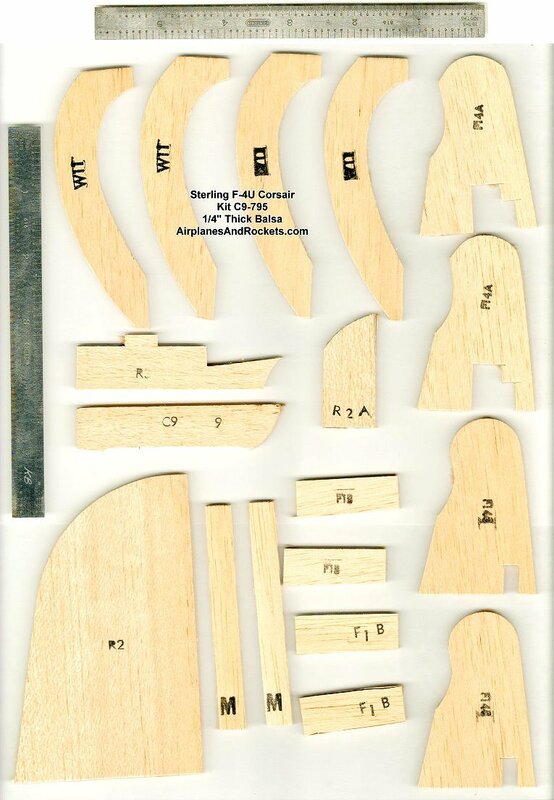 They would not be likely to supply the pre-shaped gull wing leading edges or tapered balsa parts, so extra carving would be required - not an insurmountable task to anyone willing to take on building such a model in the first place. More to come as the Corsair progresses... The gull wing should be fun to build! 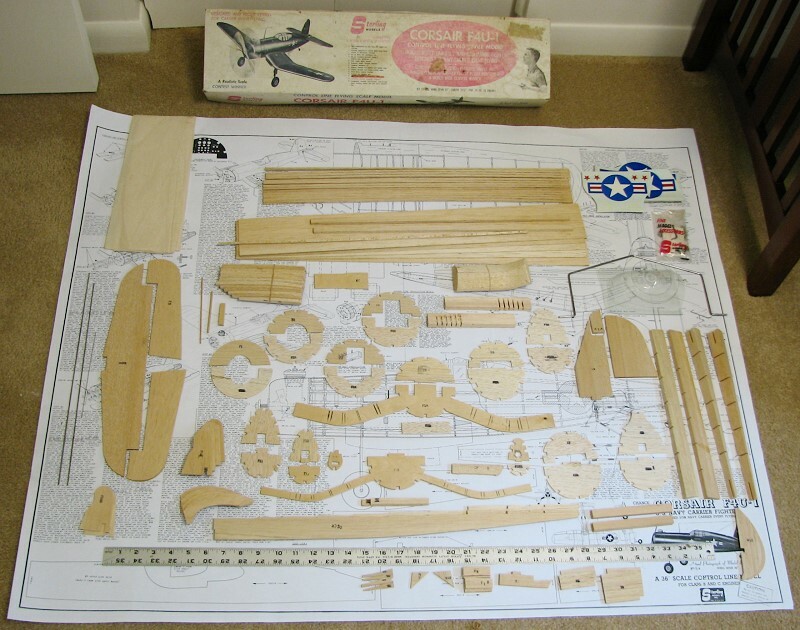 Full-Size Parts Shapes below (click for larger versions). 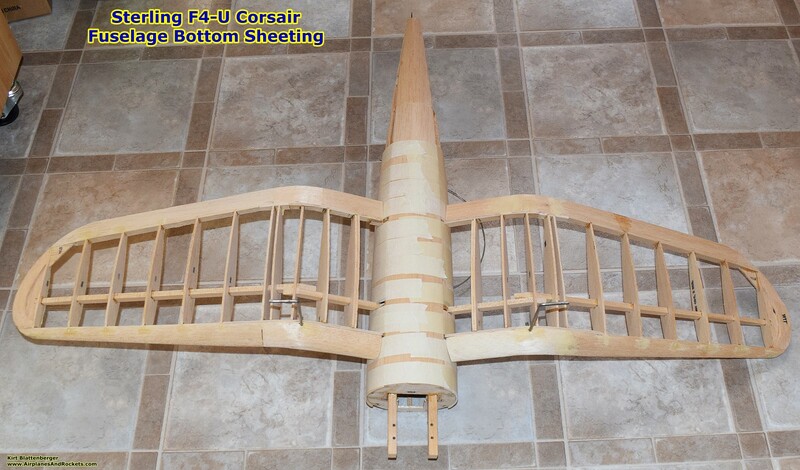 NOTE: I do NOT have a scan of the plans.